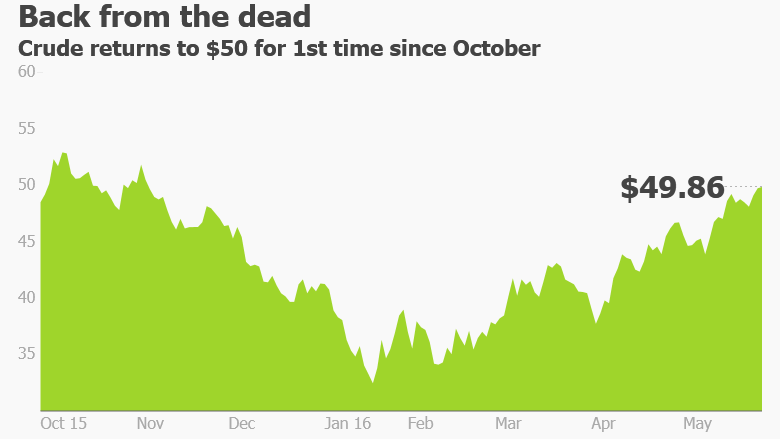 World oil prices have just passed a key milestone on their long journey out of the doldrums, hitting $50 for the first time in seven months. The big milestone happened earlier than many expected, fueled by major supply outages that wiped out production in Nigeria, Venezuela and facilities in Canada being disrupted by major wildfires. 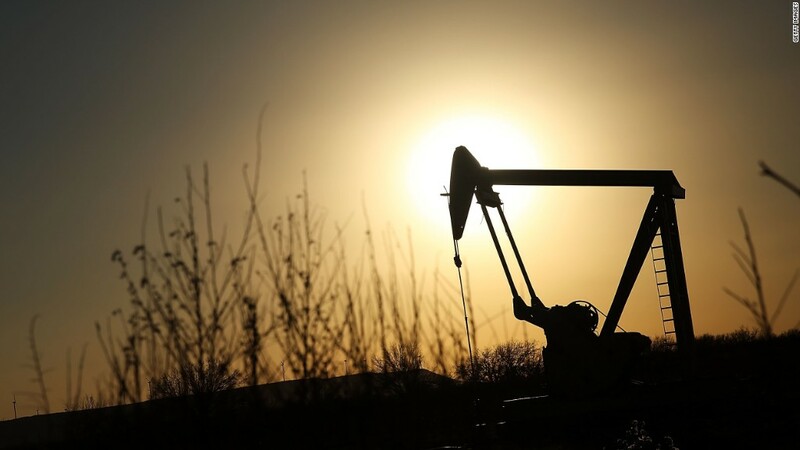 Both U.S. and Brent crude prices climbed back above $50 a barrel early on Thursday following a report showing that U.S. crude stockpiles had fallen by more than expected. For WTI oil, it's the first time above $50 a barrel since October and leaves it an incredible 93% above its February low of $26.05. That ultra-low price was the weakest in nearly 13 years and set off alarm bells around the world, causing global stock markets to plunge. While the recovery to $50 is good news for oil companies like Chevron (CVX) and countries like Nigeria that depend on oil revenue, prices are still painfully low. Crude was well above $100 a barrel as recently as two years ago. "Remember, $50 was the number where a lot of producers began to panic and bleed deep, deep red ink," said Tom Kloza, global head of energy analysis at the Oil Price Information Service. "This is not a renaissance. It's still dark ages for an awful lot of producers." The global oil market has been helped by a decline in U.S. oil production. It is exactly the outcome that Saudi Arabia and other OPEC countries were hoping for when they implemented a strategy of pumping near-record amounts of oil to regain market share. But the biggest reason why oil has returned back to $50 roughly six months ahead of schedule is supply outages. For instance, Citigroup estimates that pipeline explosions in Iraq, Nigeria and Colombia took about 1.1 million barrels of daily production offline in the first quarter. Just as those issues were resolved, militant attacks on pipelines knocked Nigerian output down by 800,000 barrels per day and Alberta wildfires hurt Canadian production by 1.1 million barrels, Citi estimates. That's on top of political crises in Venezuela and Libya keeping output low there as well. Stronger demand from India, China and Russia has also played a role in lifting oil prices. Overall, Citi estimates that global demand grew by about 1.4 million barrels per day in the first quarter, exceeding expectations. All of this means that the epic supply glut that caused oil prices to crash no longer looks so big. In fact, many analysts think the oil markets have moved more into a balance between supply and demand. Goldman Sachs even argued in a recent report that the oil market flipped into deficit this month after two years of persistent oversupply. Of course, that doesn't mean oil prices are going to skyrocket back to triple-digit territory. Even newly-bullish Goldman Sachs and Citigroup are predicting prices just in the low-$60 range by the end of next year. "Every dollar from here on is much more difficult to achieve," said Kloza. That's partially because higher prices could very well encourage U.S. shale companies and other producers to start pumping more oil. Concerns about an influx of new production led Goldman to warn oil could even dip back to $45 early in 2017. And then there's the OPEC factor. The oil cartel is set to meet next week in Vienna, but few expect the deeply-divided group to do the oil market any favors by cutting or even just freezing output. In fact, a senior Gulf source told CNNMoney there is no discussion of a new bid to freeze production.